This is a review based on an advanced reader copy from the author; the book. The Dead Lands, which I recently reviewed here, is the prequel to this book by Dylan Morgan – The Dead City. In the first book, a team of highly trained soldiers from Erebus are sent in response to a radio signal from the sister planet Hemera, indicating that the President of Hemera and his family are awaiting rescue after being in stasis since a nuclear war one hundred years prior. They are sent by the avaricious and pig-like Colonel Paden, who features prominently in this second book. Rather than a barren land with no surviving inhabitants, the team finds a baking, dusty, rubble-strewn wasteland populated by murderous thugs and a completely destroyed capital city of Magna, overrun with hordes of horrifying and ghastly mutants. The sole interest of these mutants is killing and eating the organs of their prey. In The Dead City, another crack team is heading to Hemera and Magna, accompanied by Colonel Paden. He wants to find the treasure in gems said to be hidden within the capitol city, ostensibly for Erebus but in reality for himself. He brings with him physicians to tend to his health and three prostitutes to tend to his other needs. The team is led by Lieutenant Marshall, a much-decorated soldier revered by his men. Among the team members are Ryan and his sister Jayde, who is also a soldier and very close to her brother, and also the loathsome Murdoch, who has hated Ryan since their training and fantasizes in graphic ways about what he will do to and with Jayde, if he ever gets the chance. This time the soldiers are aware of what awaits them, and the trek to the capitol’s palace is a running of the gauntlet, with the gruesome deaths of both soldiers and mutants. The mutants, who have deadly aim with sharpened metal blades, are held off by a plasma guns (Berserkers), which blow them into bloody bits but which cannot stem their unending tide. Eventually some of the groups into which the team has been split reach the deepest level of the palace, where the President and his family, long since dead, were once housed. Paden then follows in relative safety, at the cost of more men, and the search of the building and sewers for the gems begins. The Dead City has an inherently interesting story line with characters you can really love or hate. My dislike of Colonel Paden was so great, I prayed for a mutiny. While Ryan is suitably indomitable and brave, the author has also created many minor characters who grabbed me emotionally. As I said about The Dead Lands, this is not a story for the faint of heart. There were times when I was overwhelmed with the repetitive and gruesome slaughter; there’s a limit to the amount of gore I can handle. Luckily, each time when I thought I’d reached that limit, the story and characters kicked back in and I kept reading. The ending was a total surprise and made it more than worth reading the book. I want the sequel! Two things. I wish there had been more of a transition between the previous book and this one – seeing what happened to the first team when the remnants of it returned to Erebus, for example. I also wondered why the mutants never killed and ate each other. The relentless gore aside, the author does a great job of describing his world and drawing the reader into it. This book should appeal to everyone who likes strongly written, post-apocalyptic thrillers. PS, this is a planet I would never want to visit! Great review. If I remember correctly the mutants eat each other once they are dead, but they don’t kill each other. There were some hints in the book that the mutants do have some ‘human’ qualities (or rather, they care for their families) so yes, I think there’re some surprises to come. Looking forward to them, then! 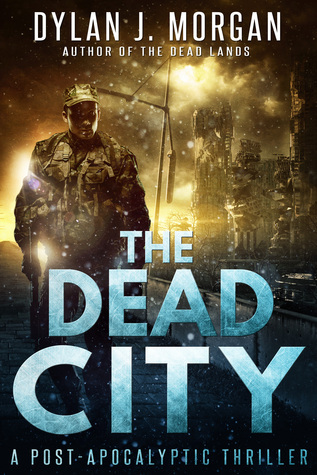 Noelle Granger reviews The Dead City by Dylan J. Morgan – A post apocalyptic thriller – head over to Rosie Amber to read the full review. It does indeed, thanks Tess.